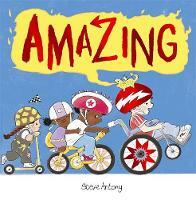 Amazing is a fun, expressive picture book about a little boy and his pet dragon, Zibbo. 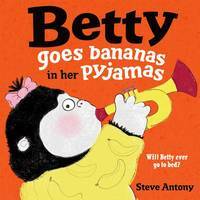 Steve Antony has created an upbeat celebration of friendship packed full of positivity for everyone; his central message of understanding, acceptance and being oneself is deftly conveyed with joy and exuberance. 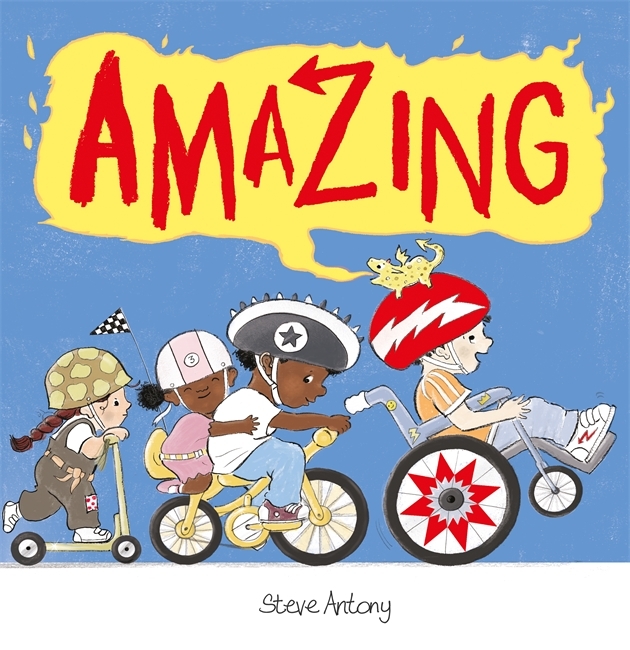 Here, Steve Antony talks to us about where ideas come from and why he wanted to write Amazing. I get asked all sorts of weird and wonderful questions at author events. There's no telling what a young child will ask or say. "How old are you?" "What is your favourite colour?" "Have you ever accidentally set fire to your house?" I’ve been asked this question so many times now that I have a different answer for just about every age group. Inspiration can come in any manner of forms and can strike when you least expect it. But as odd as this may sound, I don’t necessarily think ideas can be 'found'. I remember once making the mistake of describing ideas as dandelion seeds to a class of three and four-year olds. I said that ideas are like dandelion seeds that dance on the air and if you see one you must quickly clasp it with both your hands before it disappears forever. My metaphorical explanation got lost in a sea of blank-faced children who were far more interested in scribbling with crayons. 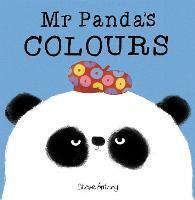 As an artist and creator of picture books, I like to think that inspiration and ideas are everywhere. They are in the people we meet, the places we go and the books, newspapers and magazines we read. They are in music, television and all over the internet. They are in overheard conversations on the bus, train or tube. They are born from happiness, sadness, joy and frustration. Some people try to find ideas in the same way that some people try to find coins with a metal detector on a sandy beach. I tend to be more reactive than proactive and like to think of myself as more of a receptor than metal detector. I tune in to what's happening around me, and I do this quite naturally because I'm a people watcher and I’m easily distracted. A visceral reaction to something I've seen or heard might spark my imagination and spur me on to reach for my A5 sketchbook or make a note on my phone. Someone once told me that unless you record an idea within seven seconds you will forget it. I’m not sure how true that is, but what I do know is that unless I write 'milk' on my shopping list I will forget the milk. 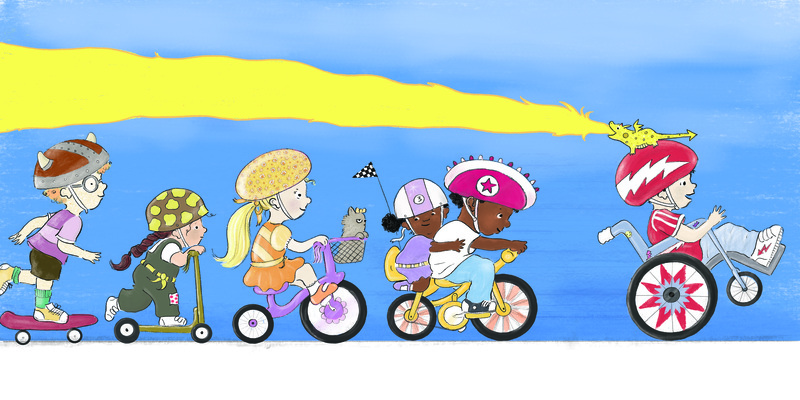 Every one of my picture books was sparked by something I’ve seen or experienced. I have so far written and illustrated fifteen picture books, and I can clearly recall how each and every one them began. 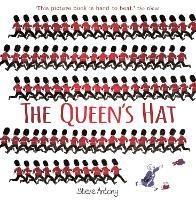 My first picture book, The Queen's Hat came from a photo of the Queen grasping her hat by the trim of its brim on a windy day. It was from a newspaper article my hubby cut out for me. He thought it might inspire a story. He wasn't wrong. 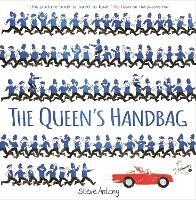 The Queen's Hat was shortlisted for the Waterstones Book Prize and won the Evening Standard's Oscar's Book Prize, and it spawned a series of four funny landmark-orientated romps. 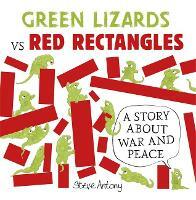 Green Lizards Vs Red Rectangles: A Story About War and Peace was inspired by Malevich's painting 'Eight Red Rectangles'. At the time, I wasn't familiar with Malevich's work. I just happened to see it on the cover of an art magazine. 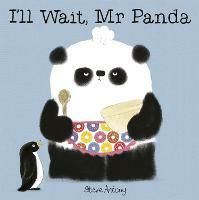 My deadpan Mr Panda series came from an obsession with drawing pandas and Unplugged came from almost bumping into a lamppost because I was glued to my phone. But what I'm particularly eager to share with you is why and how I was inspired to create my latest picture book, Amazing, and I'm very grateful to Foyles for allowing me to do so on their blog. Amazing may be my fifteenth author-illustrator picture book but its journey from idea to publication was a little more circuitous than that of my previous titles. 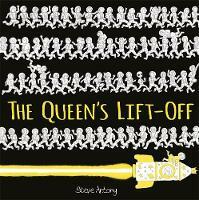 You may be surprised to learn that I wrote and illustrated the first draft before my Queenie debut. 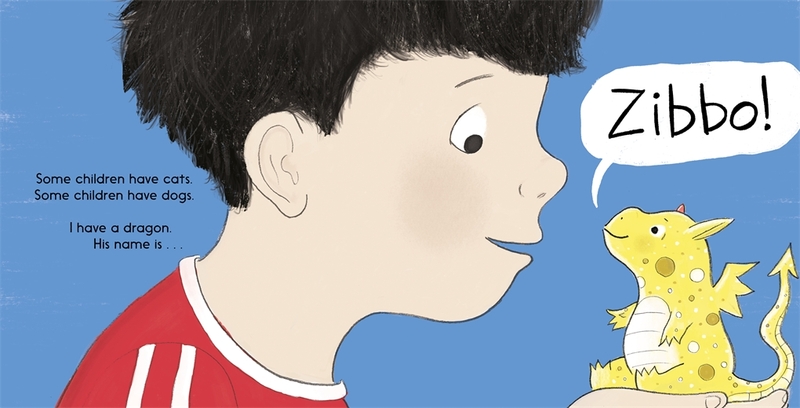 Simply put, in Amazing a little boy introduces us to his playful pet dragon, Zibbo. It’s a celebration of friendship and imaginative play (and the boy just happens to be a wheelchair user). I am not a wheelchair user, but as a gay man I too am a minority, and I know how it feels to not see yourself reflected in the books you read. 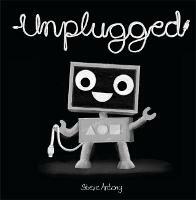 As a child I never really saw myself reflected in any of the picture books I read, nor could I find myself in comic books or graphic novels as a teenager. Because of this, while studying for an MA in Children’s Book Illustration at Anglia Ruskin University I researched trailblazing children's authors and illustrators like Ezra Jack Keates (The Snowy Day) and Lesléa Newman and Diana Souza (Heather Has Two Mommies). Snowy Day was the first mainstream picture book to feature an African American child as a main character, way back in 1962. In 1989, Heather Has Two Mommies was the first picture book to feature gay people. 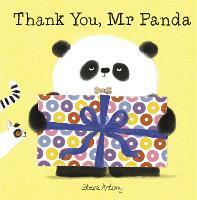 But I struggled to find many UK trade picture books featuring children with specific needs. Susan Laughs (by Jeanne Willis and Tony Ross) is a brilliant book about a girl who happens to be a wheelchair user, although this is not immediately obvious as a wheelchair isn’t featured on the cover. While at uni, I also worked part-time as a Student Support Worker in Swindon Art College. I had never worked with disabled students before so I really didn’t know what to expect. One of my students was a wheelchair user. Every time I worked with him he would update me on all the fun things he’d done over the weekend. He’d even keep me posted on his social life. He had this infectious zest for life, not to mention a wry sense of humour. I worked with another wheelchair user who wanted to be a games designer, and I worked with and supported many other students with specific needs. Some were dyslexic, some wore hearing aids, some had ADHD, some had Asperger’s. This was a truly eye-opening job, and as I settled into my new role I became more acutely aware of the challenges that many of my students faced on a daily basis, not least the narrow-mindedness of those around them. Let's face it, being a teenager can be rough at the best of times. Peer pressure, fitting in, feeling isolated, depression. It’s even tougher if you’re in a minority. 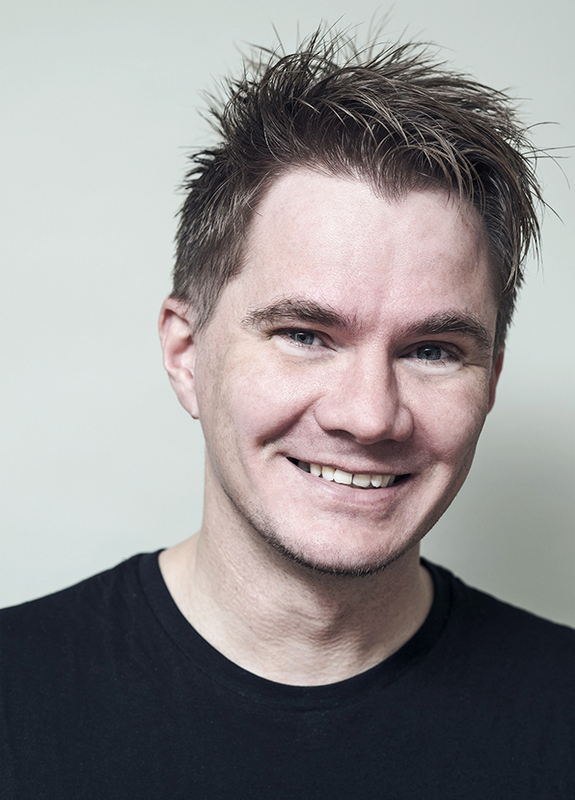 As an aspiring author, I developed a huge desire to write a story featuring a disabled child. But unlike many other books featuring disabled children, I didn't want my character's wheelchair to define his story in the same way that my students didn’t want to be defined by a disability. In my mind, my students were defined by their personalities, interests, opinions, hobbies and aspirations. Yes, they required different levels of assistance, but they really didn’t want to be treated any differently to anyone else. I wanted to focus on possibility and what makes each and every one of us amazing, so I invented Zibbo. Zibbo is a loveable, cheeky dragon. He’s also very small, possibly the smallest dragon anyone has ever seen. Zibbo embodies that very special something inside us all that makes each and every one of us amazing in our own unique way. Like Susan in Susan Laughs I wanted the main character’s wheelchair to be incidental. I also wanted my character's wheelchair to be smack bang on the front cover of my book for all to see. This is very important. Believe it not, it’s rare to find this sort of incidental inclusion so boldly depicted on the front cover of a UK trade picture book, even in 2019. I remember taking a dummy book of Amazing, which was then called Zibbo, to the Bologna Children’s Book Fair. Again, this was before my first book deal. I actually managed to show it to some publishers and the reaction was mixed. One publisher said I should lose the wheelchair. Others said it was ‘too niche’ or ‘wouldn’t sell’. I did receive some positive feedback, too. One publisher said it was ‘very brave’ while another said ‘it’s got legs’ which I thought was an interesting choice of words. My now agent, Elizabeth Roy, loved it. But upon my return from the fair I decided to shelve Zibbo in order to focus on other ideas. For five years my dummy book of Zibbo remained buried under a pile of old drawings in my wardrobe. I was quite happy to focus on other books (becoming a published author was a dream come true and suddenly I was very busy) but I hadn’t forgotten about my cute, yellow dragon. 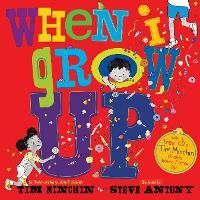 It wasn’t until last year, during a gap between books, that I decided to show it to my publisher for the first time. 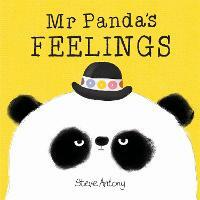 Emma Layfield, my editor and publisher at Hachette Children’s Books, loved it. Yes, it needed polishing up and my drawings of children had improved considerably since uni, thanks to illustrating books like When I Grow Up (written by Tim Minchin) which incidentally features an array of minorities. Finally, Zibbo was ready to spread his little wings and fly. So, while some ideas may come and go in the blink of an eye, other ideas may take years to grow and become clearer. Some ideas may be inspired by something as simple as a photo. Others may be inspired by a lifetime of experience. Ideas for stories are everywhere, but sometimes you have to feel them before you can see them. 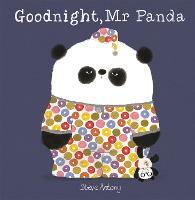 Steve Antony is a graduate from the prestigious MA in Children's Book Illustration at Anglia Ruskin and the author-illustrator of The Queen's Hat and Please Mr Panda. 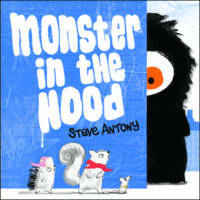 Only debuting in 2014, Steve has had enormous success: The Queen's Hat won the Evening Standard's Oscar's First Book Prize, and was shortlisted for the Waterstones Children's Book Prize. 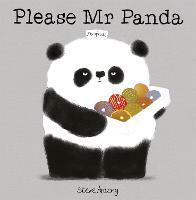 Please Mr Panda was chosen as Picture Book of the Month by US retailer Barnes & Noble, who held over 650 Panda events over one weekend.